At times, it even seemed as if the Fox News host might be gunning for Nielsen’s job as he bombarded her with his own proposed solutions to the border crisis. “That is part of the problem,” Nielsen said, adding that steps are already being taken to address just that issue. “We’re looking to do everything we can throughout the system to apply penalties where we can,” she said. Nielsen went on to argue that “there’s a debate in Congress” regarding the executive branch on implementing an order like that, prompting Carlson to blast Congress while advocating for more direct executive actions. The Homeland Security chief responded that Trump has been clear that it is “all on the table” and he’s serious about shutting down the border. “Yes, everything is on the table,” she reiterated. Their years-long court battle — at a time when some critics are pushing the federal government to do away with birthright citizenship altogether — was only settled recently when B.C.’s highest court upheld a ruling that the parent’s custody battle should be dealt with in China even though the boy, now 3, was born in Canada. Tensions flared in December 2017 when the father flew with his son to Vancouver son on one-way tickets, apparently without the mother’s consent. The mother flew to B.C. a few days later and spent a couple of weeks with her son before flying back to Beijing for work. She agreed to let her son stay in Canada until February 2018. The father appealed the decision arguing that Mayer had committed a number of errors of law or fact. The Post reached out to lawyers for both parents but they either did not return messages or were unavailable. Source: ‘Birth tourism’ case presents quandary for parents after break-up: to settle their custody dispute in Canada or China? 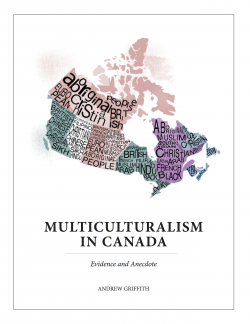 I was really pleased to see this detailed Angus Reid survey on attitudes towards birth tourism. Timing perfect as will be discussing birthright citizenship with Audrey Macklin next week at Metropolis (see my deck Birth Tourism – Metropolis 2019). Appears by the efforts by activists like Kerry Starchuck, Richmond area MPs Alice Wong and Joe Peschisolido, my health financial data-based research (Hospital stats show birth tourism rising in major cities) and the related media coverage helped encourage the government to take the issue more seriously in its commitment to study the issue and, I suspect, encourage Angus Reid to conduct this study. The poll has breakdowns for region, gender, age, income, education, and political orientation but not, curiously, for immigrant/non-immigrant. Most of the differences of opinion reflect overall difference of opinion on immigration and citizenship issues: younger, female, more educated and those with higher tend to be more supportive, whereas the opposite is true with respect to older persons, males, less education and lower income. 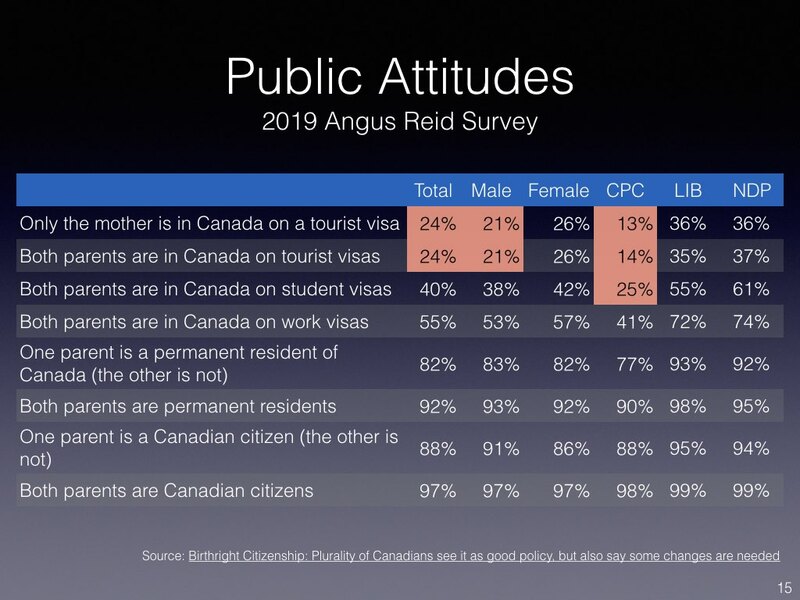 The political orientation divide is the most striking with the biggest surprise to me is the relatively high support (one-third) among Liberal and NDP leaning voters to support birthright citizenship for those on tourist visas, the classic example and practice. Hard to explain are Conservative leaning voters who make greater distinctions between situations of both parents being citizens or permanent residents and those when only one parent is a citizen or permanent resident. Which babies born on Canadian soil should be granted automatic citizenship? It’s a question that has appended itself to the Canadian political and policy narrative in this election year; and one on which Canadians share some areas of consensus and others of deep division, according to a new public opinion poll from the non-profit Angus Reid Institute. Today, most Canadians feel this concept – that anyone born in Canada is a citizen – goes a bit too far. Almost two-thirds (64%) say a child born to parents who are in this country on tourist visas should not be granted Canadian citizenship, and six-in-ten (60%) say changes to Canada’s citizenship laws are necessary to discourage birth tourism. That said, more Canadians are inclined to believe birthright citizenship is a good policy (40%) than a bad one (33%). Canadian opinions of when to grant citizenship are nuanced, changing with various scenarios offered. For example, 55 per cent say a child born to two parents in Canada on work visas should be conferred citizenship. This drops to 40 per cent if both parents are in Canada on student visas. Canadians considering the Conservative Party in the coming election, as well as older residents (those ages 55-plus), are inclined to say that birth tourism is serious problem for Canada. Those considering the Liberal and New Democratic Parties – and those under 35 years of age – are more likely to say the problem is not serious. With Donald Trump’s recent threat to remove birthright citizenship rights, many international families may wonder how this could affect the nationality of a child born to immigrants. Below, family law Attorney Evie Jeang, founder of Ideal Legal Group, Inc., explains that without birthright citizenship, children born to immigrants and non-citizens will not be recognized as citizens of any country, and that by eliminating these laws, citizenship grants for children of international families will become unnecessarily complex, and the surrogacy market could take a hit. In other words, children of international intended parents obtain US citizenship upon birth by a gestational parent in the US Among many legal, medical and ethical factors, birthright citizenship offers an appeal to international families without US citizenship looking to conceive through surrogacy. Thus, the popular commercial surrogacy market could take a hit without birthright citizenship attracting wealthy foreigners. International family and divorce law firm, Ideal Legal Group Inc., frequently encounters the issue of birthright citizenship for foreign couples looking to conceive, particularly among their clientele base from mainland China. Ideal Legal Group’s Chinese clientele face legal and cultural opposition to surrogacy in their country, and accordingly, many Chinese nationals come to the United States, where it is legal and ethical to employ a gestational surrogate to carry their baby. Through birthright citizenship, the child is eligible to receive US citizenship benefits, including education, social welfare and treatment in American medical facilities. A child with US citizenship is also eligible for dual residency in countries that recognize this concept. Ideal Legal Group helps intended parents secure their birthright by ensuring parentage over their child in which they choose to be delivered by an American surrogate. Through their work with Surrogacy Concierge, Ideal Legal Group locates surrogates of specificity for international clientele, ranging in a variety of education and socioeconomic status. Once a surrogate is selected, the legal process begins. The legal team drafts agreements on behalf of the intended parents to ensure that once the baby is born, the parental rights are transferred from the surrogate parent(s) to the intended parents. In the State of California, this is executed through the Family Code in which a parentage action confirms the birthrights of the intended parents. The legal team drafts agreements between the intended parents and a gestational surrogate (and their spouse if applicable), memorializing through a legal agreement the medical stages of surrogacy. The intended parents are represented by one attorney and the gestational surrogate is represented by another attorney. California surrogacy laws provide that a surrogacy contract must contain the date that the contract was entered into; the persons from which the gametes originated; the identity of the intended parent(s); and the process for any necessary pre-birth or parentage orders. Ideal Legal Group incorporates provisions that protect the intended parents’ birthrights. Further, the legal team focuses on identifying the risks and responsibilities that each party is assuming, including but not limited to, surrogate compensation, what happens in the event of an unfortunate miscarriage, and protocol if the surrogate has multiple children rather than the one child which was contracted. The surrogacy contract is a map for the process. Ideal Legal Group also handles the courtroom work. Pre-birth parentage orders are needed to finalize the intended parents’ legal parental rights. No actual court hearing is needed; however, pre-birth parentage orders are filed in advance of when the baby is born, and the Judge signs off on the transfer of parental rights from the surrogate to the intended parents. Eliminating birthright citizenship would be an overreaction to fears about a growth in birth tourism, according to an Ottawa immigration law professor. Canada’s Citizenship Act enshrines the principle of jus soli, conferring automatic citizenship on anyone born on Canadian soil, making it one of just 30 or so countries in the world to maintain birthright citizenship. But a recent reaction against the phenomenon of “birth tourism,” in which non-resident non-Canadians give birth in the country in order for their children to obtain Canadian citizenship, has led to calls to tighten up the law. At its policy conference in Halifax last summer, members of the Conservative Party of Canada passed a resolution to amend the act so that birthright citizenship is only automatic when one of the child’s parents is either a citizen or permanent resident of Canada, following the example of Australia, which made a similar move in 2007. Despite the passion the practice arouses, Jamie Liew, an associate professor at the University of Ottawa’s faculty of law, says it’s important to remember that there is currently no legal bar to birth tourism in Canada. And she strongly opposes any amendment that would tackle it by ending birthright citizenship. “In my opinion, it would be a massive overreaction to a very small problem that will lead to humongous social problems,” Liew says. Such an amendment, she says, would affect every Canadian, because people would have to prove their citizenship regardless of where they were born. In addition to the cost to the taxpayer of a whole new layer of bureaucracy, Liew says, there would also inevitably be mistakes and bad decisions in complex or difficult cases. “People will end up in court challenging decisions, which is expensive for everyone,” she adds. In a recent study carried out for the Institute for Research on Public Policy think tank, author and commentator Andrew Griffith, a former senior official at Immigration, Refugees and Citizenship Canada, suggested that previous figures may have heavily underestimated the incidence of birth tourism. Statistics Canada numbers indicate birth tourism peaked in 2012, when the agency recorded 699 births to mothers whose residence was outside Canada, falling to 233 in 2015, before rising again in 2016 to 313. Griffith says the discrepancy can be accounted for by the fact that birth tourist mothers are more likely to use their temporary Canadian address on birth registration documents used by Statistics Canada, while giving their real addresses abroad for the purposes of hospital payments. However, he acknowledges that his figures overstate birth tourism to some extent, because the billing data does not distinguish births to temporary residents such as corporate transferees or international students or children born to Canadian expatriates returning home temporarily to give birth. He says he welcomes the federal government’s recent commitment to look into the issue and says he hopes they can get a better handle on the precise number of birth tourists. Despite his discomfort with birth tourism, Andy Semotiuk, an immigration lawyer with Pace Law Firm in Toronto, says he’s a firm believer in birthright citizenship. “The troublesome thing for me is the people making money from advertising and facilitating anchor births,” he says, suggesting legal solutions focus on those profiting off birth tourism, rather than the mothers engaging in it or their children. Provides an example of regulatory and legal approaches to reducing the extent of birth tourism. While the national security rationale given is overblown (“ridiculous” in the words of others), the fraud and misrepresentation of purpose of visit is not, although may be hard to prove in court. Of course, in the Canadian context, if a women openly stated the purpose of her visit was to give birth with the intent to obtain Canadian citizenship for her child, and met the security, medical and financial requirements, there would be no grounds for visa refusal and no fraud or misrepresentation. Over two years, the now-41-year-old raked in millions through her business, where mothers-to-be paid between US$40,000 and US$80,000 each to come to California, stay in an upscale flat and give birth, authorities said. Li, who was arrested on Thursday, is one of 20 people charged in the first federal crackdown on birth tourism businesses that prosecutors said brought hundreds of pregnant women to the United States. Jing Dong, 42, and Michael Wei Yueh Liu, 53, who allegedly operated “USA Happy Baby,” also were arrested. More than a dozen others, including the operator of a third such business, also face charges but are believed to have returned to China, the US Attorney’s office in Los Angeles said. While it is not illegal to visit the United States while pregnant, authorities said the businesses – which were raided by federal agents in 2015 – touted the benefits of having US citizen babies, who could get free public education and years later help their parents immigrate. The charges include conspiracy, visa fraud and money laundering. But US authorities said the businesses also posed a national security risk since their customers, some who worked for the Chinese government, secured American citizenship for children who can move back to the United States and once they’re 21 and then sponsor their parents for green cards. Messages left for Li and Dong’s lawyers were not immediately returned. Derek Tung, Liu’s lawyer, said the growing interest among Chinese women to give birth to American babies drew attention to a phenomenon long employed by citizens of other countries. In the past, operators sometimes ran into trouble with local code enforcement officials when neighbours in residential areas complained about crowding or excess trash, but they did not face federal scrutiny. That business dated to at least 2010 but advertised having brought 8,000 women to the United States – half of them from China – and claimed to have been running since 1999, prosecutors said. Each business brought hundreds of customers to give birth in the United States and some didn’t pay all of the medical costs tied to their care, prosecutors said. One couple paid the indigent rate for their hospital bills – a total of US$4,080 – even though they had more than US$225,000 in a US bank account they had used to shop at luxury stores including Louis Vuitton, according to court papers. Li, who operated You Win USA, told an undercover federal agent who was posing as a pregnant Chinese citizen that her company would train her to interview for a visa and pass customs, according to court filings. En quelques années, le tourisme obstétrique est devenu une véritable industrie à Richmond, en banlieue de Vancouver. Une vingtaine de maisons de naissance chinoises sont en activité dans cette ville d’environ 200 000 habitants, dont plus de la moitié sont d’origine asiatique. Dans l’hôpital de la ville, 22 % des bébés sont nés de mères non canadiennes. Aperçu de cette industrie en pleine croissance. Plusieurs maisons de naissance sont en contact avec des agences en Chine qui leur trouvent des clients. Elles font aussi de la publicité dans les médias, ici au pays. « Bienvenue dans notre club pour la grossesse, la maternité, la formation postnatale, les visites touristiques et le bonheur d’un bébé citoyen canadien », peut-on lire dans une langue chinoise (traduit avec Google) dans une des publications sur internet dans la rubrique des petites annonces. Les familles qui payent le gros prix pour avoir un « bébé passeport » sont traitées aux petits oignons. Certaines maisons de naissance ressemblent à un véritable « tout inclus ». On offre la collecte à l’aéroport, l’hébergement, la nourriture, le transport aux rendez-vous médicaux, ou encore de l’aide pour remplir les papiers de citoyenneté, explique en entrevue un journaliste basé à Vancouver qui écrit régulièrement sur le sujet, Ian Young. Cette industrie est très mal perçue par de nombreux citoyens. Le député local, le libéral Joe Peschisolido, a parrainé l’an dernier une pétition visant à reconnaître le problème afin de s’y attaquer de front. « J’ai demandé au gouvernement de dire tout haut que le tourisme obstétrique est mauvais. Et que même si c’est légal, que c’est illégitime. Que c’est un modèle d’affaires qui ne doit pas être toléré et qu’on doit prendre des mesures pour le démanteler pour éventuellement l’éliminer », a-t-il affirmé en entrevue au Journal. Que l’accouchement soit planifié ou que les mères arrivent à l’improviste, l’hôpital de Richmond — ou tout autre hôpital canadien — ne refuserait jamais d’offrir des soins de santé urgents à quiconque « en fonction de sa capacité de payer ou de son lieu de résidence », soutient une porte-parole des autorités de santé publique de Vancouver, Carrie Stefanson. « Mais nous nous attendons à être indemnisés, que ce soit directement ou par le biais d’une assurance voyage », ajoute-t-elle. La plupart des mères s’inscrivent à l’avance et reçoivent des soins prénataux, précise-t-elle. La pointe de l’Iceberg ? L’hôpital de Richmond fait possiblement face à un problème de tourisme obstétrique encore plus important que ce que démontrent ses chiffres officiels, selon le député Peschisolido. Les statistiques sur les mères étrangères sont calculées en fonction de leur résidence de facturation. Or, plusieurs d’entre elles recevraient leur facture directement à la maison de naissance de Richmond. Les douaniers canadiens ne peuvent pas refuser l’entrée au pays à une femme, même s’ils la soupçonnent de venir au pays uniquement pour accoucher. « En vertu de la loi, la grossesse n’est pas en soi un motif d’interdiction de territoire », précise une porte-parole de l’Agence des services frontaliers du Canada, Jayden Robertson. Un couple rencontré par Le Journal dans le cadre de ce reportage sur les « bébés passeport » n’a d’ailleurs pas caché ses intentions lorsqu’il a atterri à l’aéroport de Toronto, en octobre. « Je leur ai dit de mon plein gré que je venais pour accoucher », admet Hrena Singh, une nouvelle mère de 26 ans venue d’Inde pour offrir la citoyenneté canadienne à son enfant. Les questions des douaniers à l’arrivée de Hrena et de son conjoint, Aman, se sont limitées à leur situation financière. Ce couple, qui a traversé le Pacifique, a fait appel aux services d’un avocat spécialisé en immigration pour éviter de se mettre dans l’embarras. La première étape consiste à obtenir un visa de visiteur. Une fois ce document en poche, les douaniers peuvent difficilement leur refuser l’accès. Les familles qui viennent ici pour accoucher dans le but d’obtenir la citoyenneté canadienne pour leur enfant proviennent aussi de pays riches, comme les États-Unis. Un avocat de Toronto spécialisé en immigration a même constaté une hausse d’intérêt des Américains pour le tourisme obstétrique au Canada depuis l’élection de Donald Trump à la présidence. Selon Me Davidson, certains Américains sont attirés par la réputation enviable du Canada à l’international. Le passeport canadien est perçu comme étant « plus utile » par certains de ses clients, explique-t-il. Les données obtenues par Le Journal concernant l’origine des mères étrangères ne permettent toutefois pas de confirmer cette tendance au Québec. Dans les cinq dernières années, le nombre d’Américaines accouchant dans la province serait plutôt stable. Si plus d’Américaines accouchent ici à cause de Trump, les étrangères sont aussi maintenant plus nombreuses à choisir le Canada au détriment des États-Unis, soutient une accompagnatrice de naissance de Montréal, Rivka Cymbalist. Les États-Unis demeurent toutefois la Mecque du tourisme obstétrique. Mais un certain déplacement vers le nord s’est opéré en raison de la rhétorique anti-immigration du président, soulignent de nombreux experts. M. Trump a promis de s’attaquer au phénomène des « bébés passeport » en abolissant la citoyenneté à la naissance. Le gouvernement Trudeau a récemment lancé une enquête pour mieux connaître l’envergure des « bébés passeport » après avoir minimisé longtemps son importance. Phénomène en pleine explosion, il s’agit de femmes étrangères qui accouchent au Canada après avoir fait des milliers de kilomètres pour donner naissance ici dans un seul but : offrir la citoyenneté canadienne à son enfant. Le tout soulève des questions éthiques et légales. « Le gouvernement admet enfin qu’il doit faire une étude, c’est un changement de cap assez significatif », soutient Andrew Griffith, un ex-haut fonctionnaire fédéral qui a publié des données inédites en novembre. Les travaux de M. Griffith ont démontré que Statistique Canada sous-estime largement le nombre de naissances de mères étrangères au pays. Le gouvernement Trudeau s’entête pourtant à se fier à ces données qui sont contestées par des experts. À titre d’exemple, l’agence dénombrait 313 naissances de mères étrangères dans tout le Canada en 2016. Or, la même année, 378 mères non canadiennes ont accouché uniquement à l’hôpital de Richmond, en Colombie-Britannique, selon les chiffres fournis par le centre hospitalier. L’étude de M. Griffith, qui n’a pas été contestée par Ottawa, démontre qu’environ 3600 mères étrangères ont donné naissance au Canada l’an dernier, sans compter le Québec. En additionnant les accouchements dans quelques hôpitaux montréalais, on en obtient environ 4500. De ce nombre, environ la moitié serait du tourisme obstétrique. « Bien que ces statistiques indiquent que ce n’est pas une pratique très répandue, le gouvernement du Canada reconnaît la nécessité de mieux comprendre l’ampleur de cette pratique ainsi que ses répercussions », souligne le ministre de l’Immigration Ahmed Hussen. The second part of the Journal de Montréal series. The most interesting nugget being Conservative immigration critic Michelle Rempel essentially disowning the CPC policy resolution calling for abolishing unqualified birthright citizenship (I may have missed an earlier reference). Le gouvernement fédéral promet de s’attaquer aux consultants illégaux en immigration qui contrôlent une partie de l’industrie du tourisme obstétrique après les avoir laissés prendre racine au pays. Le Journal rapportait hier qu’environ une femme étrangère accouche chaque jour au Québec après avoir fait des milliers de kilomètres pour donner naissance ici dans un seul but : offrir la citoyenneté canadienne à son enfant. Le Canada et les États-Unis font partie des rares pays riches où il est encore possible d’obtenir la citoyenneté ainsi. Ce phénomène des « bébés passeport » est en pleine explosion au pays. Certains des consultants auxquels ces mères étrangères ont recours font partie intégrante du stratagème (surtout localisé à Vancouver) permettant à des femmes — principalement chinoises — de venir accoucher ici en se faisant passer pour de simples touristes. « Tout nous porte à croire que des consultants en immigration sans scrupules incitent les demandeurs à mentir sur la raison de leur visite au Canada », soutient un porte-parole d’Immigration Canada, Peter Liang. L’avocat montréalais Hugues Langlais soutient que ceux qui gèrent les maisons de naissance de Richmond, en Colombie-Britannique, pourraient être considérés comme des consultants illégaux en vertu de la loi. Au Canada, seuls les avocats, les notaires et les consultants en immigration certifiés peuvent prodiguer des conseils en matière d’immigration, comme l’obtention de visas de voyage. « Si des gens font de la promotion pour des naissances au Canada — comme les maisons de naissance de Richmond — et font des démarches pour solliciter ou renseigner des clients, ils pourraient s’exposer à des poursuites », croit-il. Immigration Canada dit mener un examen afin de connaître la meilleure façon de serrer la vis aux consultants non autorisés. Or, jusqu’à présent, Ottawa a fait bien peu pour stopper leur progression. C’est que l’agence fédérale responsable de mener ce genre d’enquête admet à mots couverts qu’elle n’a ni les ressources ni le temps de s’occuper de la lutte aux consultants œuvrant dans le domaine du tourisme obstétrique. L’Agence des services frontaliers du Canada (ASFC), responsable de faire respecter la loi sur l’immigration, se concentre avant tout à assurer la sécurité nationale, et elle s’attaque uniquement aux plus gros délits. « L’ASFC engage des poursuites pour les cas les plus sérieux de fausses déclarations commises par des consultants en immigration sans scrupules », fait-on valoir. L’ASFC et Immigration Canada ont d’ailleurs été incapables de fournir des données sur les enquêtes en cours concernant la lutte aux consultants frauduleux. Parallèlement, Ottawa refuse pour l’instant d’accorder plus de pouvoir à l’ordre professionnel qui régit le travail des consultants en immigration. Il croit qu’avec un ordre professionnel comme celui des dentistes ou des ingénieurs, l’ACCPI pourrait mener des enquêtes dans le but de démanteler les maisons de naissance qui pullulent à Vancouver. Les facilitateurs du tourisme obstétrique affichent leurs services un peu partout, des petites annonces jusqu’aux réseaux sociaux comme Instagram. ♦ Le Plus International Mother and Child club, situé à Vancouver, offre notamment dans son annonce des services « haut de gamme pour les mères d’outre-mer et leur bébé », précisant que les bébés sont canadiens. ♦ En plus du logement, de l’hébergement, du suivi médical, etc., le Canada Moon Centre B & B propose son aide pour le traitement des certificats de naissance, des passeports canadiens, des documents de voyage et des visas. ♦ Sur internet, le Canada Vancouver Ocean Baby Club écrit : « Bienvenue dans notre club pour la grossesse, la maternité, la formation postnatale, les visites tourististiques et le bonheur d’un bébé citoyen canadien ». ♦ Le Mansion Moon Center précise dans son annonce qu’une infirmière habite la villa qu’elle loue, et qu’on offre le transport depuis l’aéroport et vers les rendez-vous médicaux. Un important facilitateur du tourisme obstétrique au pays juge la pratique choquante, même si elle est légale, et voudrait la voir cesser. « Je n’essaie pas de me justifier et de dire que c’est noble ce que je fais, affirme sans détour Alex Davidson en entrevue dans son bureau de Toronto. Me Davidson redoute les dérives d’un système qu’il juge « injuste » pour les candidats à l’immigration qui respectent le cours normal du processus. Les « bébés passeport » pourraient même « devenir un problème » pour le Canada, selon lui, s’ils choisissent de s’établir ici et de fréquenter les universités en grand nombre dans quelques années. L’avocat torontois d’origine américaine et russe déplore que ces personnes aient accès aux systèmes d’éducation et de santé comme tous les autres Canadiens, simplement parce qu’ils sont nés ici. Mais pour l’instant, la pratique est encore légale et Me Davidson a l’intention de continuer de profiter de ce lucratif marché en offrant ses services aux familles souhaitant entrer au pays en toute légalité avec un visa de voyage. Il collabore aussi avec six médecins, qui touchent chacun une rémunération pour l’accouchement et le soutien prénatal et postnatal. Il y a quelques semaines à peine, il a publié une vidéo sur sa très populaire chaîne YouTube, dans laquelle il invite les familles qui envisagent de s’exiler pour accoucher d’agir avant qu’il ne soit trop tard. Dans cet extrait, Me Davidson soutient que le Canada pourrait bientôt abolir le droit du sol, car « plusieurs pensent qu’il est injuste de conserver le système actuel », prévient-il. Comme le président Donald Trump a promis de mettre fin au tourisme obstétrique aux États-Unis, le Canada pourrait bien emboîter le pas, précise-t-il. Mais pour l’instant, aucun parti politique fédéral ne compte aller aussi loin pour contrer le phénomène. L’avocat qualifie au passage de « cadeau pour la vie » le passeport canadien, qui offre par ailleurs « de nombreux avantages ». « Il vous reste un an pour vous décider, si vous considérez venir ici pour donner naissance. Il est encore temps d’en profiter », explique-t-il. Me Davidson s’est fait connaître dans le monde entier grâce à sa chaîne YouTube, dans laquelle il offre des conseils pour immigrer au Canada. Il soutient toutefois que le tourisme obstétrique ne représente qu’une petite fraction de sa clientèle. LE CANADA DEVRAIT-IL ABOLIR OU PAS LE DROIT DU SOL ? Le Parti conservateur n’envisage plus d’abolir la citoyenneté à la naissance pour s’attaquer au phénomène des « bébés passeport » comme le souhaite une majorité de ses militants. « Il y a clairement de l’abus, mais je ne crois pas que ce soit un problème envahissant à l’échelle nationale », croit la députée conservatrice responsable du dossier de l’immigration, Michelle Rempel. Disant ne pas vouloir « minimiser » le phénomène, Mme Rempel soutient que des analyses plus sérieuses sont nécessaires pour connaître l’ampleur et les causes du problème. Le tourisme obstétrique au Canada a fait les manchettes au cours des derniers mois après que les militants conservateurs aient voté en faveur, dans une certaine controverse, d’une motion non contraignante visant à abolir le droit du sol. Un ex-haut fonctionnaire chez Immigration Canada croit que cette solution serait la plus efficace pour mettre fin au tourisme obstétrique. Or, il juge cette mesure trop radicale pour s’attaquer à un problème somme toute secondaire. Un avis que partagent Mme Rempel, de nombreux experts ainsi que le gouvernement Trudeau. Les troupes conservatrices ont d’ailleurs déjà tenté d’abolir la citoyenneté à la naissance au Canada. La démarche a été abandonnée puisque la mesure s’avérait trop complexe et coûteuse (entre 20 et 30 millions $). Il n’en demeure pas moins que d’autres pays, dont la Grande-Bretagne, ont abandonné cette pratique, exigeant qu’un des deux parents réside dans le pays. Le président Donald Trump a lui aussi promis de resserrer les règles. Mais ce droit est protégé par la constitution américaine, ce qui le rend presque impossible à abolir. Qu’est-ce que le droit du sol ? Au Canada, le droit du sol est protégé par une loi datant de 1947. Avant, les Canadiens étaient considérés comme des sujets britanniques. Le droit du sol a été adopté dans la foulée de la Deuxième Guerre mondiale, durant laquelle beaucoup de Canadiens ont quitté le pays pour aller travailler aux États-Unis. Le gouvernement canadien voulait donc s’assurer que les personnes qui revenaient au pays après la guerre soient considérées comme Canadiennes, puisque nées sur le territoire, explique l’avocat Hugues Langlais. Source: SociétéS’attaquer aux consultants «sans scrupules» d’abord2019-01-20 – ArticleIl y a quelques semaines à peine, il a publié une vidéo sur sa très populaire chaîne YouTube, dans laquelle il invite les familles qui envisagent de s’exiler pour accoucher d’agir avant qu’il ne soit trop tard.